footnote: now it seems something is up in my Post Editing as well OY!!!! photos are duplicated when I have only posted them once ACK!!! trying to stay calm here and hoping WP settles down! 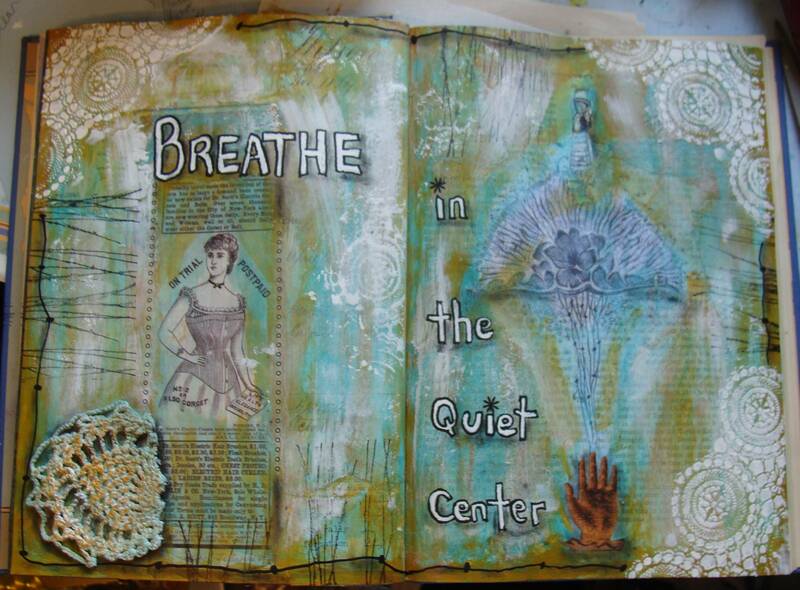 This entry was posted in Altered Art, Altered Book, Books, Collage, Fabric/Ribbon/Fiber/Lace, Journal, Mixed Media, Paint, Paper, Quote, Rubber Stamping, Tutorial/How To, Wednesday Stamper (WS). Bookmark the permalink. look at this fabulous work!! and I don’t see a single link!! good for you!!!!! turquoise is THE color of the year!! and your transfers are fantastic as are your book pages, love the hand at the bottom and the stencils of course! and as always thanks for your support! Muah!!! A wonderful example of how we can use our pain to create beauty! Thanks that you show your working steps. I have learned a lot. i just love looking at all those art supplies in the back! and i’m partial to paisleys… persian pickles i like to call them 🙂 have a great day. Oh, honey! I am so sorry to hear that you’re having such a frustrating time. I have had the same problem with Blogger and just can’t seem to get things right, which is why I have had a bright white background for the past few weeks. I really hope it works out for you as coming to your blog is one of the highlights of my day. Your breathe pages are amazing. I love playing with paint like you have. This turned out so good! I’m sure it was great to play let out the frustration through your brush. Hang in there! Thank you for sharing this beautiful song, Patty….it’s so restfull …love the music and the lyrics just zapped me…..The AJ pages are beautiful…I love turqoise and for sharing the techniques, especially the various layers to an AJ page…is simply inspiring…. WOW, what a lot of steps to get to the finished journal pages. And, what a great quote. Now to go back and breathe and listen to your song! Wonderful pages, Patty! Thanks for the step-by-step photos. Love your step by step pics of work in progress! Just fabulous my dear Patty! You have outdone yourself! I LOVE IT! Patty, you are a great friend. Thanks for this wonderful journal tutorial. I will stamping again and this is a great inspiring. Thanks so much for this. Your work is amazing. I love it. Big Hugs for you. Your beautiful pages are actually relaxing me at this very moment, and I need that today, so thank you 🙂 Also for showing us your steps in the process. Isn’t it fun to put all your paints in front of you etc and just go at it? I am sorry for your wordpress problems, I think it happens every where sometimes. Do you back up your blog and save the file to your computer? I hope so. Thanks, Patty, for showing these pages step by step. I never do that on my blog and yet it’s one of favorite things to look at on artists’ blogs! 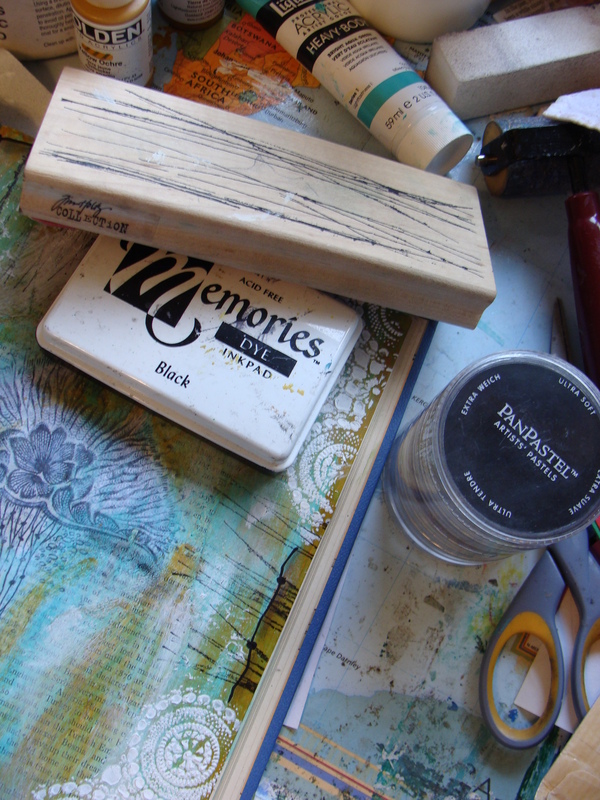 The thing that surprises me is using the Tim Holtz stamp. I doubt if I would have bought that but it’s the perfect thing for these pages! So you’ve reminded me to take a second or third look at things and not disregard some so quickly. Your journal pages look lovely. It is wonderful to see the work in progress as well. Thank you so much for this tutorial! I love looking to your art pages Patty ! Fabulous work Patty ! Each step is interesting, Wow… I learn a lot with you !!! Love the step by step photos. That helps visual people like myself so much. Thank you for the inspiration! Great artwork. SO enjoy coming to your site every day. Thanks again. how exciting – every time I look at your artworks that I have at home (lucky lucky me) I keep analyzing them and wondering: how on earth did she…? I keep thinking of your quote from the last post and now this art piece. yes. I really NEED to make my own “breathe” reminder. Ah…glorious, glorious work, Patty! I’ve not visited in such a long time, I’m out of touch! Hope all is well. OH Patty that is so fantastic, thank you for sharing your inspiring workshop!Your pages are so creative. Wonderful post…wonderful pages and thanks for the step-by-step—I always find that interesting. Hope WP irons itself out for you soon…..
Oh my goodness Patty, so much went into these pages. I loved reading about your process whilst listening to the sweet music. Glad you found the doily useful……you certainly put it to great effect! Thanks for sharing your process with us! Way to go. I love process oriented posts. You did a super fantastic awesome job. Can you tell I really liked the step by step? And I can totally relate to “one clean finger.” Of course, all my cameras have paint and a few other “things” on them too. Thanks so much for sharing this, dear friend. Wonderful post Patty. You are very generous to post your step by step. Sorry to hear about all the troubles with your blog. A real bummer! Here’s hoping to all the problems being resolved. Outstanding piece and walk through of process! I always forget to take pictures along the way…I just seem to get caught up in what I’m doing and forget everything else. Wow ! thanks for sharinghow to breathe – not been so easy recently. Sorry to read of your troubles with your blog – so maddening ! I always appreciate it when you show a tutorial — I learn so much from you! This is simply beautiful — all my favorite colors! The finished project is simply stunning. Bravo and thank you. I love how you’ve documented each stage of this beautiful piece. I’ve never tried doing that. Like you, my camera isn’t usually in my art room (and mine is almost a cave, literally. I have a small dormer window for natural light and have to depend on electricity to have any real illumination!). Beautiful – and meaningful – journaling. I like that you shared your creative process. It’s always fun to see how others do it. What a treat! I just love these. 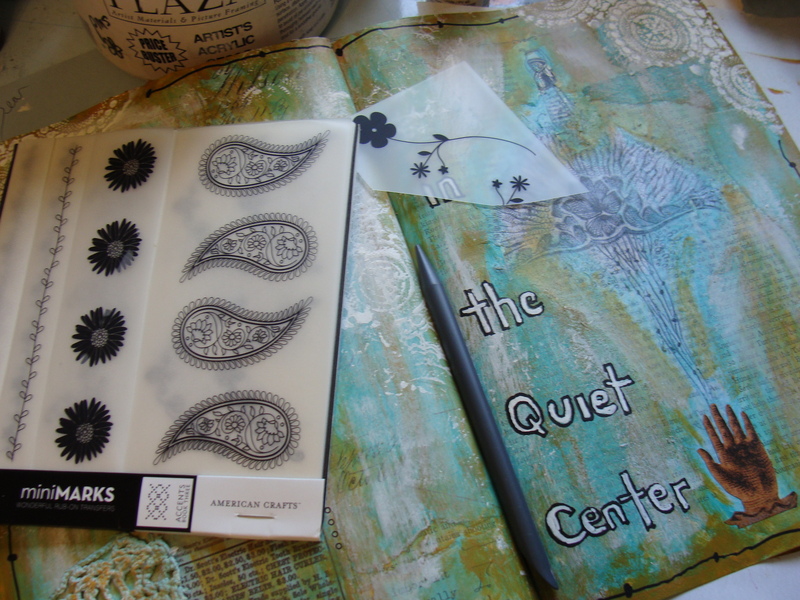 I am looking at each little element and think the rub-ons and Tim Holtz stamp just compliment this beautifully. I love the Dover jellyfish! Thanks for sharing each little part. You are always so generous! thanks also for the swedish proverb quotation…i meant to come by earlier and say i shared it with some friends on twitter & email… have a great weekend! I love this entire series of pages. Thank you so much for breaking down the process for this one! It is so beautiful! Oh this is fabulous!!! Love it! Stunning pages! And so cool that you showed the process from start to finish. Thank you! Lovely page, the colors are so fluid and transparent, the text seems to be lightly floating on the page… love it! Still so lovely! I always think of you now when I see an encyclopedia.